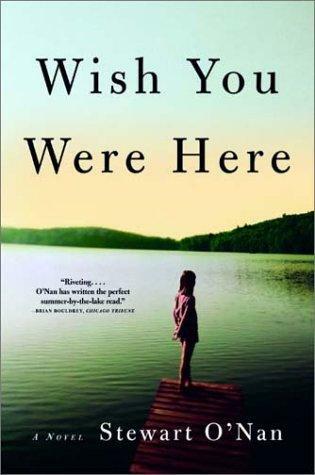 After her husband’s death, Emily Maxwell gathers the family at their summer cottage one last time before it is sold. Her daughter Meg and son Kenneth bring their families as they do every summer, and try to fit in all their favorite activities while divvying up the contents of the house and waxing nostalgic about summers past. The black sheep of the family, Meg has had a rough year of rehab and divorce and has driven from Detroit with her kids Sarah and Justin to join their family with whom her relationship has been rocky. Ken is a struggling photographer who just wants to find the perfect shot, and leaves his wife Lise to deal with the kids – Ella, in love with her cousin Sarah, and her younger brother Sam who compulsively steals. The perspective shifts between characters throughout the book and while it was subtle enough to confuse me at times, I thought it helped to round out the story well. The relationships in this family are complex and having multiple perspectives created a richer, more nuanced story. In typical O’Nan style, the details are meticulous. This was what I loved about his novel Last Night at the Lobster – the reader can feel, see, smell everything that is happening. It is less effective however, when describing a game of golf with unfamiliar terminology or, more unpleasantly, someone’s bowel movements. There is a little too much information and it got tedious at times (did it really need to be 517 pages? ), but mostly I enjoyed reading O’Nan’s beautiful language. When all was said and done, not a lot happened in this book. It’s not an action story, of course, it’s a relationship story but even so, I was surprised when I finished and realized that very little changed in the characters’ lives from the beginning to the end. Luckily, O’Nan’s beautiful writing and finely-tuned character development makes up for a lot. I got to know the characters very well – I did just spend a week’s vacation with them, after all – and now I’m ready for the sequel. Yes, Stewart O’Nan has written a follow-up called Emily, Alone, a (much shorter) novel which will be released in March. 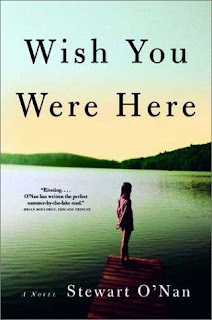 Since so many years have passed since writing Wish You Were Here I expect the writing to be tighter and more sophisticated. I’m looking forward to rejoining the Maxwells for part two.